The Panthers are off to an impressive start this season. Exceptional offense, fourth quarter defense and rebounding in both games helped Georgia State start 2-0 for the first time since 2014. Despite his team’s success in the first two games of the season, head coach Gene Hill is still hunting for areas to improve in. “I am very proud of the team’s performances in the first two games, but as a coach I’m always focused on what we can do to get better,” Hill said. “I know we still have a lot of room for improvement. Though they won both games, the Panthers gave up some big runs in both games. Against the North Carolina Greenville Spartans, they gave up a 7-0 run to start the game and allowed them to shoot an 52.4 percent from the field in the third quarter. Against the Florida Atlantic Owls, they gave up another 7-0 run to start the game. The Panthers also allowed the Owls to shoot 46.7 percent from the field in the third quarter. The Panthers won their first game of the season 70-63 against the North Carolina Greenville Spartans. Redshirt sophomore Jada Lewis gave the team a boost with her 14 points and six assists, which led the team. Walnatia Wright, a redshirt graduate, helped considerably by scoring 15 points and grabbing 11 rebounds, a team high. KK Williams also contributed well with 13 points and four 3-pointers. Allison Johnson logged eight points and nine rebounds in 28 minutes. The Panthers finished the first game with 41 rebounds and out-rebounded the Spartans by five. They also had four blocks and seven steals. Georgia State struggled in the fourth quarter, but UNCG struggled more. While they only shot 33.3 percent from the field, the Panthers held the Spartans to a dismal 14.3 percent from the field in the fourth quarter. UNCG didn’t connect late anywhere, and shot 40 percent from the free throw line. Georgia State then pivoted and won their second game of the season 75-59 against Florida Atlantic. Lewis put up even more points this time around, scoring 20 off a 53 percent shooting. She also dished three assists and grabbed nine rebounds, a career high. Lewis, the 2016-2017 Sun Belt Conference Freshman of the Year, hurt her foot during the Panthers’ third game of the season last year. Before her injury, she averaged 15.5 points, which included a 20 point performance against the Florida Gators. Although she was out for the most of the season and it devastated her, Lewis looked and played like she had never left in these two games. Shaquanda Miller-McCray grabbed 12 rebounds and scored 13 points for her first double-double of the season. This is crucial for the Panthers considering Hill stressed winning the rebound battle every game. Miller-McCray’s three blocks complimented her double-double against the Florida Atlantic Owls. The Panthers displayed good defense in both games. In the game against the UNCG Spartans, the Panthers didn’t allow a field goal in the final 4:18. Against FAU, the defense was also stellar during the final stretch and didn’t allow a made field goal attempt in the last 5:59 of the game. 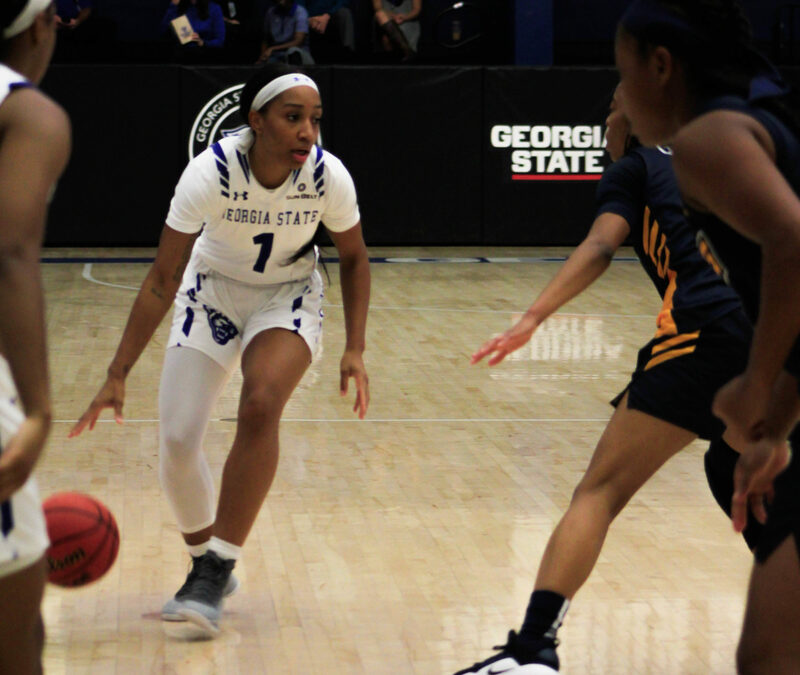 One important component of the win over FAU was Georgia State’s rebounding. The Panthers grabbed 61 rebounds to the Owls’ measly 39 rebounds. They also shot an efficient 44.8 percent from the field against the Spartans and 39.5 percent against the Owls. While the Panthers look better on offense, their defense is loads improved to begin the season. Strong rim protection and on-ball defense is something that head coach Gene Hill emphasized before the season started. The next opponent on the Panthers schedule is Rice, and they played FIU on Nov. 12. The trip to Rice is final of a four-game road trip. Their next home game is against Georgia Tech on Dec. 2.